This book will help you turn the fear and pain of losing someone into a memorable, and yes, even joyous event for family and friends to cherish and pass to each generation to follow. Hospice. Some take those seven letters as a death sentence, but this form of care does not equate to imminent death. Windham has been a hospice nurse for over 15 years and throughout her career, seen countless families struggle to make the decision whether or not to place their loved one in hospice care. 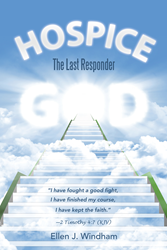 “Hospice: The Last Responder” captures the true essence of hospice care and explains everything readers need and want to know about the process, putting loved ones at ease. Look for a Spanish translation coming soon. Ellen Jane Windham is a highly educated and skilled career professional with more than 15 years of practical hospice experience working in patients’ homes and facility environments. She is established in terminal ill-patient care including assessment, counseling and patient/family education. In her free time, Windham enjoys boating and snow skiing with her partner, daughters and grandchildren. Windham currently resides in Houston, Texas.